Where there’s a dog, there should be a place to accommodate the dog! When it came to my Richy the Labrador, I actually had had to make this decision twice: first for a fluff ball of puppy and then for the grown good boy. It might be that I just got lucky with him; he didn’t get picky with either of his new houses and took to them with delight. More pleasant, though, would be the thought that it was I whose choice of the dog shelter brand was deliberate. But what was it that I did? Robust and tear-proof construction – goes without saying if your dog is (hyper)active. My first purchase was a small indoor doghouse and the next one was a bulky insulated shelter for outdoor use. To find them, I did an awful lot of research on the Internet. Below are the best picks I came across when looking for those kennels. 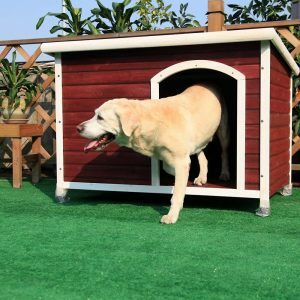 This one is a big and sturdy doghouse, which is good news to owners of larger dogs. The Petsfit Dog House stands off the ground, which keeps your dog’s bed dry in case there is some rainwater collected under it. Its shingled roof can be removed, allowing you access to the house’s interior to clean it and freshen up the bedding. The house is excellent for hot summer days because its slatted floor doesn’t prevent air from circulating freely and cooling the insides. In the cold weather, you should cover those slates with a warm blanket to make your doggo really comfy. Another good option for big and clumsy pets. The waterproof roof is slanted and seems capable of living through more than a couple rainy years. Its bottom floor is made of slats with gaps between them, so airing will be OK. However, you’ll definitely need to insulate this floor in the winter, as well as adding a cover and/or winterizing the walls. Overall, the house welcomes modifications – you might easily replace the floor, add a tarp flap to the door opening or improve its habitability otherwise. Ready for the best buy in a colder season? Not only does this dog cabin repel water but it also keeps your pet warm. Humidity and chilly wind won’t bother your dog as there is an extra space for them to snuggle. The lid may be screwed-on or attached to hinges (not supplied) so that you don’t have to crawl into the kennel to change out the bedding. 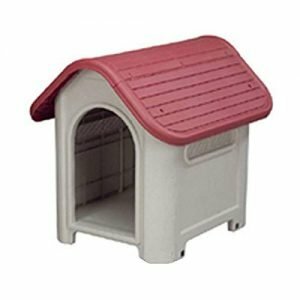 This plastic dog kennel by Confidence Pet boasts toughness and durability. Its hygienic plastic walls save energy, which is essential for a pet dwelling that is meant to live through both warm and cold seasons. It will help you to accommodate your dog out of the home; multiple sizes are available. 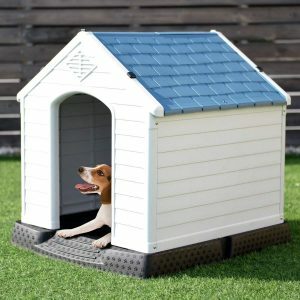 With its simple elegance, this pet house by Suncast is one of the best values for the money I’ve seen. You can install it in minutes by snapping the pieces together and it’s good-looking in the result. Even though not very thick, the plastic seems tough. When using the assembled house outdoors, make sure you have attached the included door flaps to protect your pet from rain dripping in. 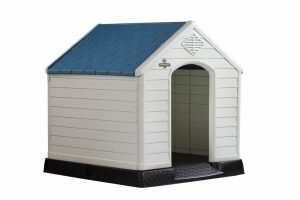 Another well-put-together kennel that will suit most dog breeds, including French bulldog and pit bull. The polymer material is firm and inflexible; it holds screws nicely, so you can go for some extra construction solidity with a screwdriver. It’s perfect for humid areas – as opposed to wood, plastic won’t rot and degrade as quickly. Also, the house is elevated to not let your pet soak in rainwater. However, its entrance is large, so a door flap would be quite appropriate. 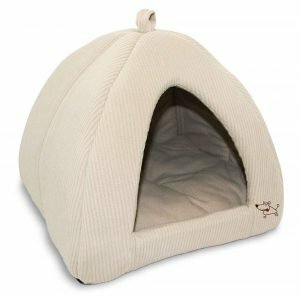 An awesome inexpensive cave-bed for your pet. That’s what puppies or kittens will appreciate for sure: this bed is warm, comfy on the inside, does not collapse, and the pillow is very soft. It’s also well stitched, thickly padded and looks great among other furniture in your apartment. This cozy house consists of four soft walls and flooring. Its roof comes stabilized with a plastic rod in the top part. Thanks to the roof zipper, you can put the house together in the proper shape with just a few movements – the same goes for its disassembly. Inside the pet den, the cushion fits nicely and snugly; it lies there unattached and flips over, allowing you to change the color. An adorable and practical product to give your doggo some personal pet zone. 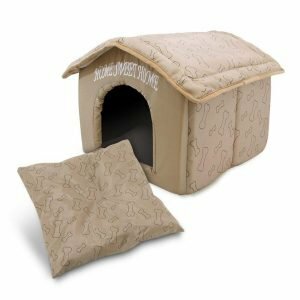 This SENYEPETS house is great for dogs who like to nest cozily and sleep a lot. Its construction manages the pieces with a type of connections called ‘magic tape links’, promising to stabilize and fortify the house. The bedding is removable, while the whole polyester thing sits tightly on its non-skid bottom. 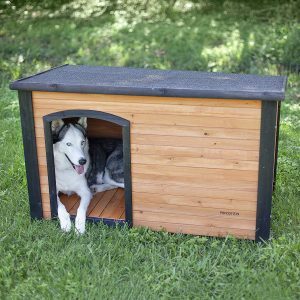 Is an Underground Dog House Safe for Your Dog? Not only is it safe but also makes good use of natural climate control. The idea behind this kind of dog den is that ground temperatures fluctuate only minimally throughout the year, remaining in a range of 55-60 degrees. While air temperatures on the surface get higher or lower with the season, an underground kennel will mimic a hole in the earth, naturally dug up and insulated. As a result, your pet will benefit from the colder ground in the summer, his/her dwelling counteracting heat magnification; the house will also stay warmer in the chilly environment. 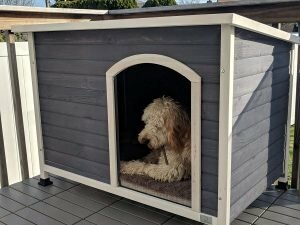 Luxury Dog House – Do You Really Need It? 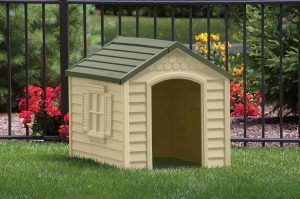 As a rule, luxury doghouses include front porch, pergola, and detachable side deck. It also usually feature superior materials and unmatched insulation. But hey, let’s be honest – dogs often appreciate simple things. You might build a palace for your loving pet yet he/she will enjoy sleeping on your doormat better. Not all dogs care for being pampered because many of them still remember the wild thing they used to be. Wooden or Plastic – Which One is Better? Wood is a traditional heat-insulating material that also has a stylish look. Nevertheless, modern plastic makes for a decent match to many cheaper types of wood and even beats them in that it doesn’t rot. Depending on the plastic quality, it may also be less chewable. Oak, cedar, and hevea are the best wood for a pet house if you can afford them; however, make sure that you use a non-toxic paint on the kennel to not get your canine friend into trouble. Because I live in Florida my doggie always spends a ton of time outside in the backyard. Now, we don’t have many trees so I’m really considering getting him a nice dog house in order to get some shade when he needs it. This list really makes my hunt a lot less stressful. Now I know what I’m looking for and the potential purchase candidates. Oh, now I’m intrigued at the idea of an underground doghouse. It sounds like it would probably be quite expensive, but worth it if you’re able to do it. The nice, wooden ones look great, too, although I’d be concerned with getting something the poor thing couldn’t chew up and destroy. I’ve been thinking about a dog in the future, so this is super helpful! I’ll be sure to remember this article. Welcome to PetsNeedIt.com, your exclusive online source for pets product reviews, pets care, training information and some helpful advice about choosing the right pets breed for you. PetsNeedIt © 2019. All Rights Reserved.